Dartes Shop - Bigger Than Ever! Top brands at prices just for you! Thanks to our good relationship with NESS Swimwear we've managed to secure our members a 5% discount on everything in their online store. What's more, on top of that 5% Dartes also takes a cut from the sale too. All orders are delivered direct to your door. NESS have generously offered Dartes a cut of the profits too, so every order helps raise club funds. The prices are good, and you're supporting Dartes at the same time. Just remember to pop over to the NESS swim shop at your next meet and say a big thank you to those behind the counter. Raise funds for Dartes every time you go shopping online and maybe catch yourself a great bargain along the way. Practically everything you might order online could contribute 2% to Dartes and often with savings for you. There are also monthly competitions to win iPads, holidays, or many more desirable prizes. So what are you waiting for, sign up today and help your swim team the fun way. 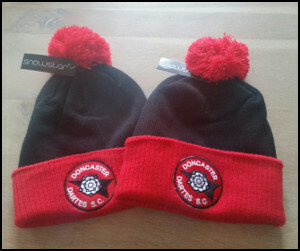 Keep your young athletes warm this winter and keep wet hair undercover with these team issue pom pom hats. As the temperature drops, so too does the effectiveness of your immune system. Help prevent those wintery illnesses that distract from training by wrapping up warm. Wet hair (boys and girls) is often a cause of such things, so keep it covered up in the winter months. Is your young athlete forever losing kit at competitions? The new version of this ever popular TYR bag should help prevent that from happening (so long as they use it, and keep it zipped up of course). Plenty of room for all their kit in the dry section, along with the usual selection of wet section and hanging points. As usual we can have Dartes logo and athlete's name embroided for easy identification. Place your order for any of these items today. Our traditional team polo has the logo on a red background for 2011. The ubiquitious Dartes swim cap has changed little in 2 decades. Extra warm, fluffy hoodie with Dartes logo. Monogrammed Dartes towels add a uniquely Dartes feel to poolsides all over the UK. 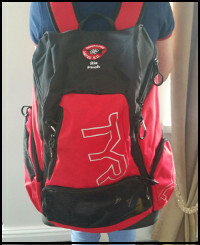 TYR Alliance backpacks, available Red/Black and White. With logo and name embroided. These items are no longer available but are shown as mementoes of fun times gone by. Our best looking training camp polo to date. Unique to the 20 at Tenerife 2011. For a change, a special black cap for Nationals. Unique for 2011, only 9 people in the world have one! For a change, an extra special black National Squad shirt. Available to those with NQT only! Special red polo shirt for 2010 training camp. The 2010 National Squad Polo with distinctive back. Specially for 2010 Minster Meet, our DIY Thunder Sticks went down a bang! The 2010 Minster Meet Souvenir Tee Shirt. Sold by the box load. Only those qualifying for 2010 British Championships got to wear this great hoodie. CIS kindly sponsored the shirts for 2009's Sardinia Training Camp. One of our better special polos, this one unique to the National Squad of 2009. Only 2009's National Squad could get their hands on one of these. For the hard working qualifiers for 2008 National Champs, a rather special shirt. The original Minster Meet Tee. Before wearing our team branding hat, hence the blue. Special edition red polo shirt for Paphos training camp, 2007. Available only to those selected for the camp. 2007 continued the tradition of red National Squad shirts. Only available to those with an NQT. During the early 2000s we had a very popular tracksuit top. This shirt for 2000 Nationals at Coventry was considered one of the nicest we'd had. One of the earliest pieces of Dartes kit, the tracksuit from the 1980s. Another early piece of team kit. This sweater from the 1980s is also autographed by Olympic Champion Adrian Moorhouse.